A couple weeks ago, we were treated to the unveiling of the latest Motorola flagship smartphone - the new Moto X. Well, the handset’s time in the spotlight was short lived because Apple’s latest smartphone, the iPhone 6, became available for purchase a short time later on. 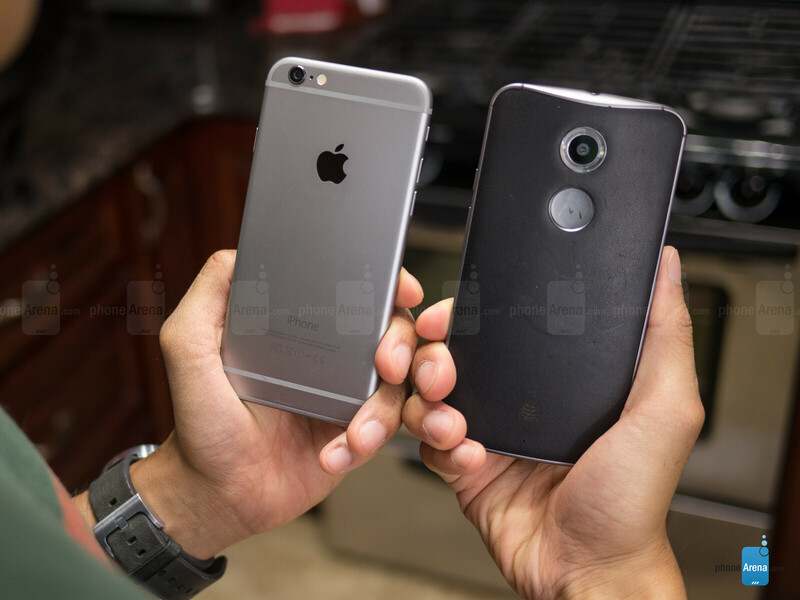 Arriving ahead of the upcoming holiday season, these two prized smartphones are no doubt going to be in heated contention against one another. Even now, as Motorola continues to fight with the heart of a champion, trying to do its darndest to one-up its rival, does the new Moto X have what it takes to disrupt the iPhone 6’s assault? Honestly, it’s really tough to say which phone has the more alluring design because they offer several unique qualities that make them so favorable. In particular, we absolutely adore the Moto X’s customizable design – one that Motorola established last year, and is something yet to be unmatched by its competitors. Thanks to the aid of its online portal, Moto Maker, buyers can select the colors of the handset’s casing, as well as its accents, to have a phone that’s uniquely different. And quite frankly folks, that’s one characteristic we love about the phone. In contrast, though, the iPhone 6 exhibits a more premium design, as it features a unibody aluminum casing. Even though we’re only given three color options to choose from (space grey, silver, and gold), we can’t argue that these paints jobs help to complement the iPhone 6’s elegant and luxurious look. Due to its premium choice of materials, it also gives the phone a substantial feel in the hand. Well, the Moto X also feels quite sturdy as well – thanks in part to the aluminum frame that wraps along the side of the phone. However, the iPhone 6 feels a little bit more comfortable in the hand. Not only is that aided by its rounded corners, but it’s able to best the Moto X in terms of its overall footprint. Essentially, it’s smaller and skinnier in frame, which allows us to better reach all corners of its display more comfortably. Despite that, the Moto X also feels good in the hand, especially if you happen to go with one of the leather finishes. Well, the material is better suited for giving us a firmer hold of the phone – whereas with the aluminum finish of the iPhone 6, it comes off a little slippery at times. We can’t deny that these are two of the more attractively designed smartphones to have come out recently, but it’s a matter of personal preference in determining the superior design. 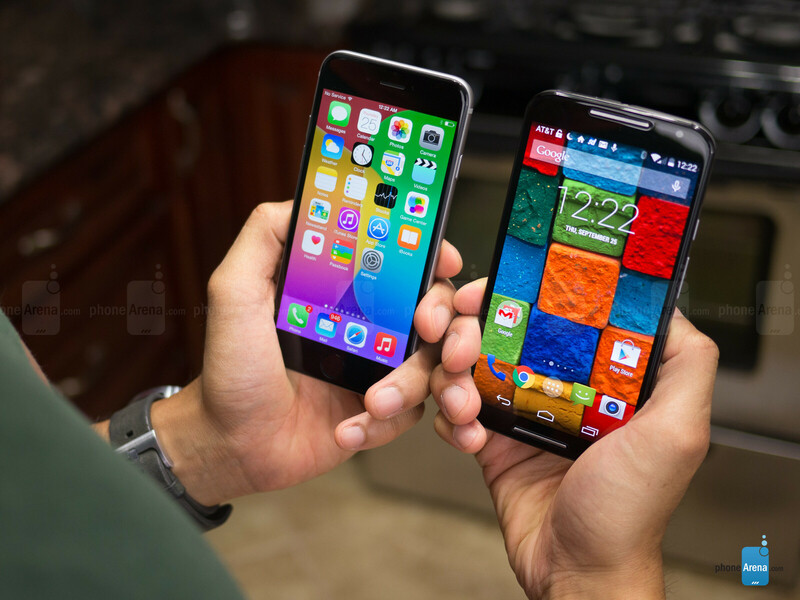 If premium and compact are the qualities you look for, then stick with the iPhone 6. Go with the Moto X if you want a differently designed smartphone that you can create uniquely using different color and finish combinations. Lucky for these two, they manage to improve over their predecessors’ display resolutions. For the iPhone 6, it’s greeted to a 4.7-inch 750 x 1334 IPS LCD display, which by Apple’s definition, is a Retina Display due to its pixel density figure of 326 ppi. Meanwhile, the Moto X betters its predecessor by offering a 5.2-inch 1080 x 1920 AMOLED display, which one-ups the iPhone 6 with its higher pixel density count of 423 ppi. From a normal distance, however, it’s rather difficult to distinguish the difference in detail with the two of them, as they deliver pretty sharp results. Upon a closer inspection with our eyes, we can clearly make out the finer details with the Moto X’s display, though. Don’t count out the iPhone 6’s Retina Display yet, just because it exhibits the characteristics of a high quality panel. In particular, it’s significantly brighter at 606 nits, versus the 385 nits tally of the Moto X. Not surprisingly, we see the results as we’re viewing the two displays outside with the sun directly shining at them – where the iPhone 6’s display remains visible, while the Moto X is nearly unviewable. In addition, the iPhone 6 is also better at reproducing colors realistically, which is an attribute that IPS LCD panels generally have. 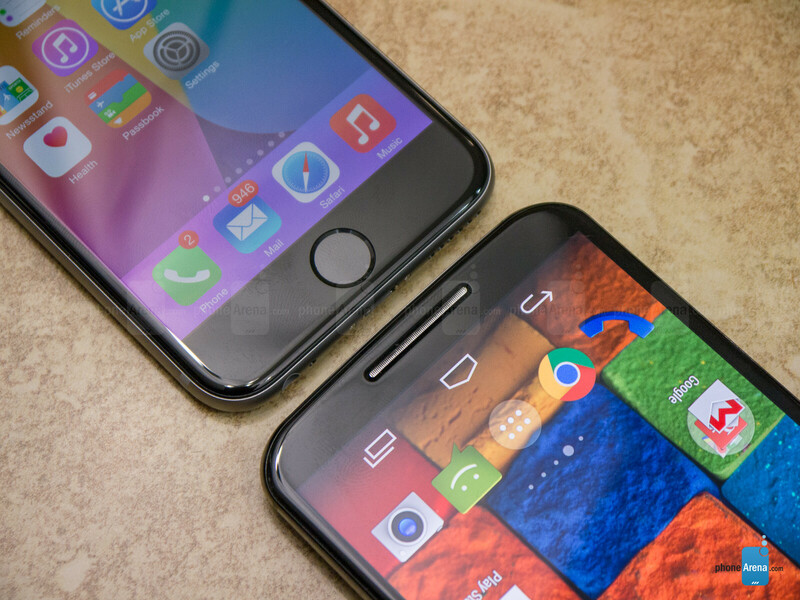 On the flip side, the Moto X favors over-saturated, vibrant but unrealistic representation. Most people don’t mind the saturation, more so when the Moto X’s AMOLED panel has a vibrant glow in the dark that catches our attention. Again, taking that into consideration, the better display hinges at what you perceive to offer the more attractive elements. Johnnnn VVVVV stop being so biased about Apple you are the worst reviewer on PA. You have no technical knowledge whatsoever..!!! "if you like premium and !!??COMPACT??! !, stick with the iPhone 6" are you kidding me???? 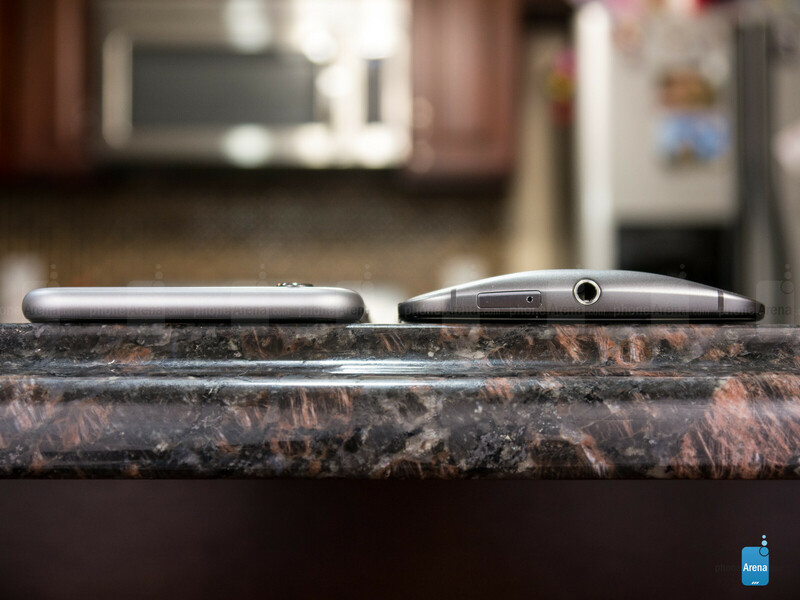 Moto x is 2 mm longer but has a 0,5 inch bigger screen. I'm sorry, but the Moto X looks so much better than this year's iPhone, and the customization of Moto Maker annihilates Apple's offering. And the screen size to phone size ratios!!! Wow, just wow. Hey Mxyzptlk's here, came out from under your bridge I see... Remember how you said that the Moto X's battery sucked, and how Apple is perfect? And then how I said it still beats Apple's battery life and it will in fact get a boost of 30%+ when Android L comes out, and you said that nothing was confirmed about Android L, and everyone corrected you and you felt stupid....? Yeah... I remember that too. Good times. Yes I said the X had an awful battery. I did use one as a backup phone. It only takes the iPhone less than an hour to get a good charge. Hence the lightning cable. Yes I said Android L is all speculation and I stand correct. Umm... like mentioned in the previous argument, it's proven. Beta testers have already confirmed 30% base savings. It's funny how Apple people will only accept news if it makes them happy, like all the issues going on with Apple are overblown, or how the iPhone 6 "will" have sapphire glass... God that was funny how certain you all were of that and how you said the phone was going to be so much better because of it. "It's funny how Apple people will only accept news if it makes them happy"? Like how "Android people" WON'T accept the same news because it's positive about Apple? And yet you also accept random feedback from Beta testing as fact before it's even made release-ready? Those statements seem a little hypocritical or at the very least contradictory. Legitimate hands on time with a prerelease of the actual OS, (also project Volta was detailed by Google itself) VS mystery claims from the internet originating from source unknown... hardly hypocritical. But then, my iPhone 6 runs great, has great battery life (1.5 days with 10 hours use, give or take a few minutes) and hasn't bent. So it's fair to say if many users have experience like mine then these "issues" with the iPhone would be overblown to many as well. So it's not being only accepting of good news - but that I'd imagine there are millions of people also having no issues at all, so why should only negative news stories or tests be taken legitimately and good ones be brushed off? I'm not an Apple apologist either, I think the iPhone 6 is "OK" but not an amazing update, it's getting a little tired and stale. I agree with you that the Moto X does look better proportioned and has some nicer design touches too, the 6 seemed to be all about being thin rather than ergonomic. I'm not saying Android L won't be great either - just that bugs and problems are often missed until mass availability so it'll only be a known quantity for sure once it's released and fully running with all the other junk that gets put on phones. I hope it is good because competition is good for everyone (except the manufacturers maybe) and the current market is looking a little stagnant, there have been no "wow" products for a while, just incremental improvements with the odd gimmick. Yeah... you're alright Jimrod. I cannot argue with you. 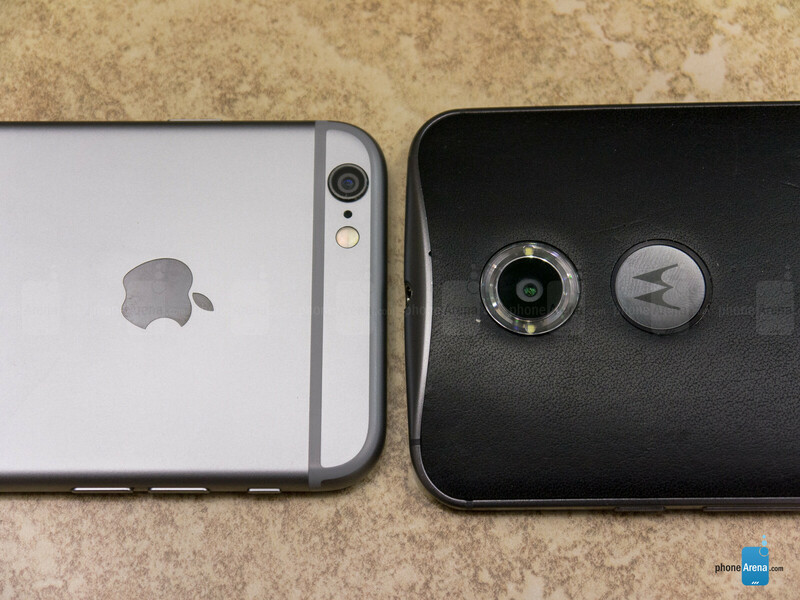 but the Moto X is still a better phone. :P lol. Nope, it just refused to sell. All it requires is a cable and not just another feature. Any idevice that use the lightning cable benefits from fast charging. LOL!! So the lightning cable is what makes it charger faster?? Not the actual AC Adapter?? If i put the lightning cable in to a standard USB port it will charge faster than a regular USB cable?? HAHAHAHAHAHAHA, soooo funny!! If you didn't begin nothing of value would be lost. I promise. If you're the only one who does then it ceases to be funny. Show me actual numbers and I'll be convinced. Are you sure I'm the only one who found it to be funny? I didn't thumb myself up, you know. Ha! You mistook him for someone with a brain! Jokes on you!